This months meat meal is pork. Pork in the form of a hot spiced sausage. I know that I shouldn’t be eating preserved meats. There is plenty of evidence out there to indicate that the preservatives like sodium nitrate and not at all healthy, but on a special occasion once a year. I think that the phrase, everything in moderation might apply. 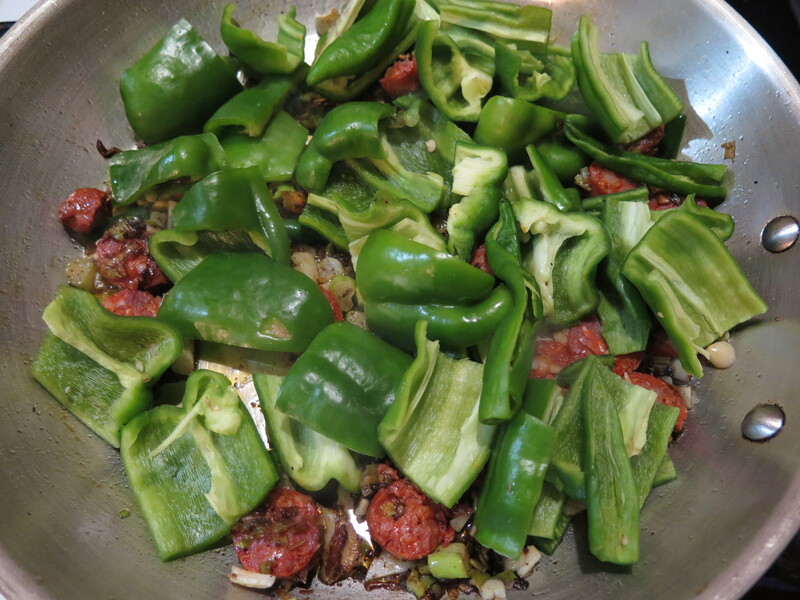 So, last night I made green peppers (capsicum), with chilli peppers and pepperoni sausage. Actually, it wasn’t pepperoni at all, it was chorizo, but I like the sound of the alliteration. I could have called it chorizo with chilli and chapsicum, but that isn’t as good. It turned out pretty well. I was pleased with it. Everything except the sausage came from our garden. I started by frying very finely sliced leeks in olive oil until they were golden and crispy, then added 1/2 a knob of finest diced garlic along with the roughly chopped capsicums and chills, plus the chunks of chorizo. Stir fried for a few minutes and then simmered with the lid on for a couple more to sweat out all the juices. It was hot and spicy, but still crisp and crunchy to bite into. lovely! I am very grateful to be able to live this wholesome, self-reliant life.